Chrysler 300 1966 – If you want an original, don’t come here. Chrysler 300c SRT8 – Information and resources on the HEMI Powered Chrysler 300c SRT8 covering 2005, 2006, 2007, 2008, 2009, 2010 and 2012. Chrysler Fanatic – Home of Chrysler Vehicle Enthusiasts. A place for Chrysler owners to show off their vehicles and non owners to find out more about the Chrysler brand. 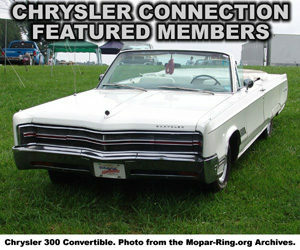 Featured Chryslers, Chrysler Information, Chrysler Photos, Links and much more. Chrysler Fifth Avenue Website – This site is dedicated to the Chrysler fifth avenue and it’s siblings. Contains photo album, forum, specs, info, tech & mechanical info, upgrades, production figures and more. Chrysler Imperial France – This site is devoted to the Imperial and Chrysler 300. Chrysler Resources – List of resources available on the 440magnum Network related to Chrysler vehicles. Including Chrysler Information, Chrysler Screensavers, Chrysler Wallpapers and more. Own A Chrysler? Your Chrysler could be featured next month!